Rudyard Kipling had described Lake Pachola in Letters of Marque (1899), “If the Venetian owned the Pichola Lake, he might say with justice, `see it and die’. Lake Pichola is one of the most beautiful and picturesque lake of Rajasthan, India. Built by Pichhu Banjara the lake is situated in Udaipur. Pichola lake is 3 miles in length, 2 miles in width and has depth of 30 feet. This is a place where you can stroll while admiring the scenic beauty with the perfect backdrop of lush green hills. This place leaves you searching for fancy words to capture its exquisiteness. On the shore of the lake Maharana Udai Singh constructed a stone made dam. The lake is surrounded by palaces, temples, bathing ghats and hills. From the Machhala Magra hill one can see the Eklinggarh Fort. Mohan Mandir is situated in the north-east corner of Lake Pichola. How to Reach Pichola Lake? Udaipur is well connected by rail route from Delhi, Jaipur, Ajmer, Chittorgarh, Jodhpur and Ahmedabad and the railway station is about 3 Km from the city centre. Another major attraction is traveling by the Palace on Wheels train. It is world’s one of the leading luxury trains. The train starts from New Delhi to Jaipur, Ranthambhore, Chittorgarh, Udaipur, Jaisalmer, Jodhpur , Bharatpur, Agra and then finally reaches New Delhi. It is a eight day tour and includes off board meals in some of the luxury hotels and fine dinning restaurants of India. You can feel of royalty onboard while traveling in the Palace on Wheels train. The tour includes world famous monuments and tiger safari at the National Park, boat ride at Lake Pichola, sand dunes in Jaisalmer with Camel Safari and sites including UNESCO World Heritage Sites. What to See Around Lake Pichola? Jag Mandir Palace: Located at the heart of Lake Pichola, Jag Mandir Palace is an epitome of serenity. Enjoy a candlelight dinner with your beloved here, as the cool breeze passes through your hair. Arsi Vilas: Want to spend some time in solitude? Enjoy some exclusive moments with your special ones at the Arsi Vilas island. As the sky plays with colors during the dusk, watch a variety of birds like coots, egrets, cormorants, kingfishers and teens joyously return to nest. 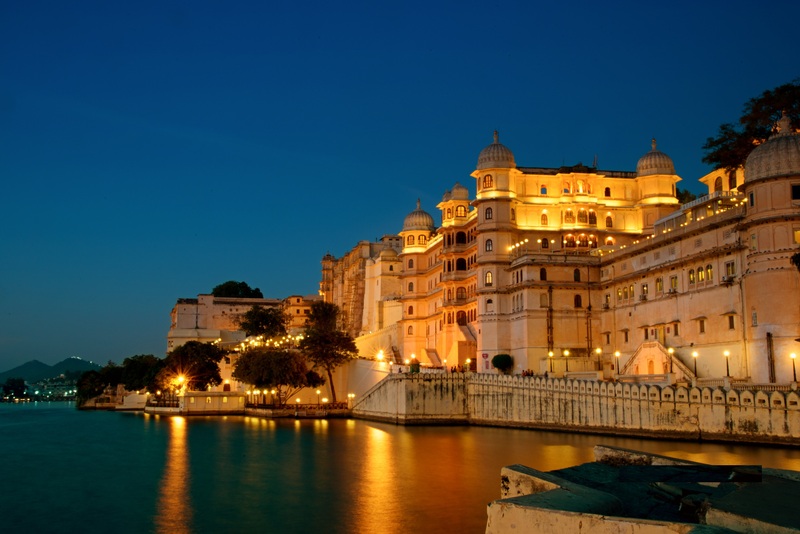 City Palace: The City Palace of Udaipur stands with pride at the banks of Lake Pichola. The palatial Palace is exquisitely beautiful with a golden dome, Chinese hanging gardens and a museum of crystals. Boat Ride: The real beauty of taking a tourist boat trip in Lake Pichola is the feeling that you are getting a personalized experience. There is no defined route that the boat tours follow. As you sail through the crystalline waters of the Lake, the sublime beauty of the nature touches your heart and soul. There are many hotels and resorts in close proximity to the lake. There are rooftop terrace restaurants that have the most beautiful view over Lake Pichola. The calm water has so many different hues of blue, reflecting the bright blue sky, near the shore it is pale blue, nearly translucent, as it got deeper it changed from pale blue to deep deep dark blue. The trees on the far side of the lake are mirrored on the lake. You can treasure the moment of silence and peace sitting at the banks of Lake Pichola or sailing on the mirrored waters of this man made Lake.